“Harbinger of History: Past Promises of the Chinese Communist Party” (历史的先声——中国共产党曾经的承诺), edited by Xiao Shu, is a compilation and analysis of pro-democracy articles published by the Chinese Communist Party in the 1940s. The book was published in mainland China in 1999, but was quickly banned. It has subsequently been republished in Hong Kong. Some netizens have taken to using quotes from the collection to counter contemporary CCP anti-democracy propaganda with the words of early Party leaders. “Harbinger of History” includes articles and commentary on democracy published in Party publications between 1941 and 1946. Pieces by Mao Zedong, Zhou Enlai, Deng Xiaoping, and other Party leaders argue in favor of liberal democracy, human rights and personal freedoms, and even admiration for the United States. Xiao Shu examines the context of this writing, published during the Japanese occupation of China in WWII and spanning the final years of the alliance between the Communists and Nationalists (1937-1945) to the resumption of the Chinese Civil War. These proclamations that “China’s only demand is democracy” and elegies to “the Chinese students fighting for freedom and liberation” present a Chinese Communist Party that made a complete about-face once it had gained power. Included in the volume are essays such as “We Aren’t Afraid of Democracy and American Influence, We Welcome Them” (我们并不害怕民主的美国影响，我们欢迎它, 1944), “In a One-Party Dictatorship, Disaster Abounds!” (一党独裁，遍地是灾, 1946), “Earnestly Safeguard the Rights of the People” (切实保障人民权利, 1941), and “Freedom of the Press—The Foundation of Democracy” (新闻自由——民主的基础, 1945). Xiao Shu compiled “Harbinger of History” while he was on faculty at Tongji Medical University (now part of Huazhong University of Science and Technology). 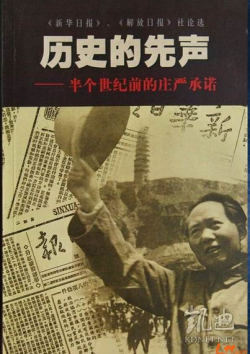 The book was first published in 1999 with the title “Harbinger of History: Solemn Promises Made Half a Century Ago” (历史的先声——半个世纪前的庄严承诺) by Shantou University Press, but was banned soon after it appeared on mainland bookshelves. The head of the press was transferred out of Shantou University, and the press’ books in storage were pulped. “Harbinger of History” was republished in Hong Kong by Bosi Press in 2002, and once again in 2013 by Hong Kong University Press. Read articles from “Harbinger of History” via CDT Chinese.